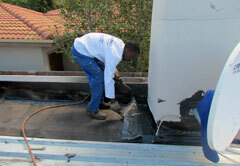 Waterproofing means resisting the ingress of water under specified conditions. Water penetration in buildings can be costly and cause major structural and internal damage. RENU Painting & Waterproofing’s services includes the repairs of penetrating damp, flat roofs leaking, sealing of parapets, sealing of roof flashings, gutters leaking or replacement thereof, lifting and sealing of balcony floors. Bitumen torch-on got its name from the installation process which is done by torching the sheets in the overlap area. 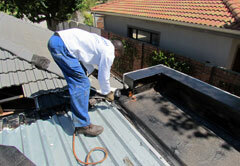 It is highly recommended for most flat concrete roofs. Bitumen is resistant to extreme temperatures and is considered to have a significant service life. Bitumen torch-on can be applied to Concrete Roofs, Balconies, Box Gutters, etc. The Acrylic Membrane and fibre paint is cost-effective and uncomplicated. It is a water-based acrylic waterproofing solution, used in conjunction with a membrane that forms a strong barrier against water and moisture. It withstands cracking and movement of the underlying substrate and is ideal for roofs, concrete slabs, parapets, flashings and walls. 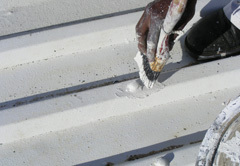 The area of application is cleaned properly to remove acids, loose paint, dust, rust, corrosion and old waterproofing. An undercoat of acrylic fibre paint is applied to the substrate, the membrane is applied and finally the topcoat of UV stable acrylic fibre paint is applied.